Photo to Painting is a Windows 8 app to turn photo into painting where you just need to upload a photo or snapshot one with your webcam, from within the app and you will get the option to paint it. This photo to painting Windows 8 app generates high quality realistic paintings out of your digital images. Once you are done with turning your photo to painting, you can now share it with others or just save it to your local machine. Also, the Windows 8’s Share Charm is well integrated with the app, and hence, you can share you photo painting via Share Charm. There is a ‘My Gallery’ section where you will find all your paintings saved. You can easily open it and view all your paintings. It’s a good entertainment app for those who are interested in creating paintings of their photos. Go ahead and download Photo to Painting app in Windows 8 now. Tweet Paint Metro is another app that lets you turn photo into painting. 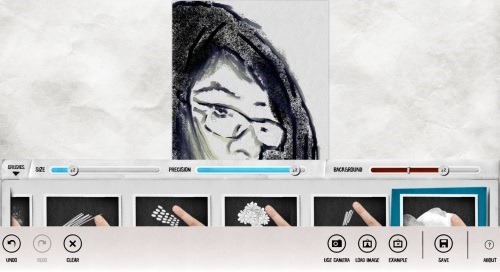 You can use pen button to draw on your virtual canvas, or upload a photo to decorate it using painting tools, emoticons, etc. There is a color palette and you can select colors for decorating your photos, add icon, background, use eraser to erase your painting, etc.. Once you are done, you can now save it to your local machine. You can then post it on your Facebook wall, and share it with your friends.Let me quickly point out the main features of this Windows 8 app to turn photo into painting. 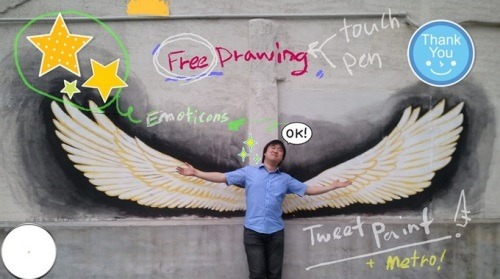 Lets you draw on your photo or just on a plain canvas. You can decorate photos using emoticons, icons, etc. Lets you save your paintings to local machine. Go ahead and explore your creativity with Tweet Paint Metro app. Download Tweet Paint Metro app in Windows 8 now. Lazy Paint: No Talent, No Problem is yet another Windows 8 app to turn photo into painting. 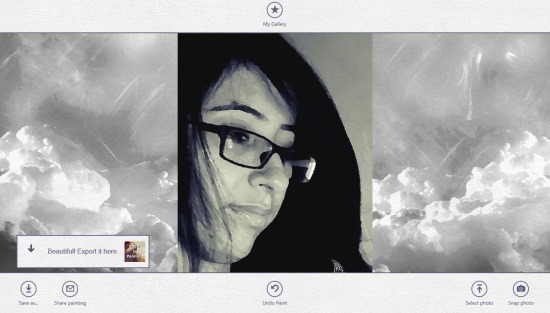 This one is my favorite sketching app as it lets you upload a picture or snapshot one using your webcam ? the app automatically converts your image to a very-light sketch and displays it on the screen ? now, you need to use the wide range of brushes in different sizes, and create a painting out of your picture. So what if you are not a great painting.. this painting Windows 8 app is there is help you turn photos into paintings. You can use ‘Erase’ button to erase your painting. Brushes such as Bristles, Splat, Spray Can, Scribble, Pointillist, Flowers, Lines, and Sumi-o. Each brush has option to resize your brush, modify the amount of precision you want, and background of you painting. Once you are done with your painting, you can now save it to your local machine or share it with others using the integrated ‘Search Charm’. Go ahead and download Lazy Paint: No Talent, No Problem app in Windows 8 now.